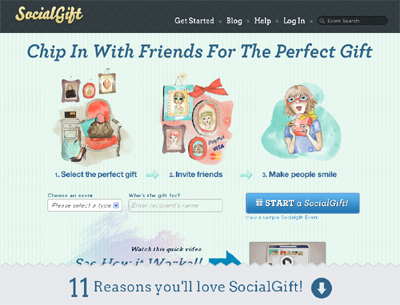 SocialGift revolutionizes the way you share gifts with friends by allowing you to buy real items in the real world. With our huge catalog of bigger and more meaningful products, finding the perfect gift with others for that special event – birthdays, anniversaries, weddings – has never been easier. Creating a SocialGift is simple! A 3 step wizard walks you through the event creation process. Facebook connectivity is built in at the core, so inviting friends is a breeze. Payments are incredibly secure and looked after by the great people at Paypal.